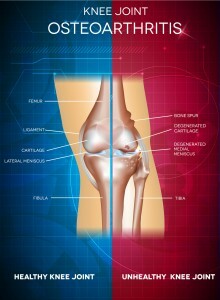 Knee Arthritis: What are the solutions for knee ache, pain and stiffness? Behavior modifications involving weight loss, exercise changes and minimizing aggravating activities can accomplish such goals. Losing weight can decrease excess stress on weight-bearing knee joints, which decreases pain while increasing mobility. Switching to activities such as swimming and cycling are less stressful on joints than running and jumping. Prescribed exercise and physical therapy can strengthen leg muscles around arthritic joints. Stronger muscles can help reduce stress on the knee joints, which can alleviate pain while improving function. Also, supportive devices such as canes, shoe inserts and knee braces have the ability to reduce symptoms. Shoe inserts can cushion mechanical strain during walking to reduce stress on knee joints. Braces can be supportive and shift weight away from the joint. Medication treatment is dependent on each individual. Usually, anti-inflammatory pain relievers are the first choice for treatment of early knee arthritis. Non-steroidal anti-inflammatory drugs and COX-2 inhibitors are commonly used for cases of knee arthritis with swelling and pain. Corticosteroid injections may be prescribed for moderate to severe knee arthritis. However they may also cause joint damage. Hyaluronic acid injections can increase the viscoelasticity of the fluid within the painful joint and has gained popularity in recent years. Arthroscopic surgery removes joint debris and torn cartilage. An osteotomy is used to improve knee alignment to reduce symptoms. Partial and total knee arthroplasty removes damaged knee joint cartilage and bone, which is replaced by plastic or metal implants. Cartilage grafting is used to replace damaged knee cartilage with healthy cartilage from other bones in your body. Glucosamine and chondroitin can be used as a dietary supplement to reduce knee pain. Both compounds are found in normal joints and it is thought that oral supplementation may help replace decreased amounts of both substances. However clinical experience over the years have shown relatively disappointing results. The Indiba Activ is one of the newer non-invasive solutions for knee arthritis. Pioneered in Europe and used for many years, it has been recently introduced as an effective options for patients in Asia. simply call us at +65 6732 2397 or leave a message below for Dr Tan to discuss a customized non-invasive solution for you.